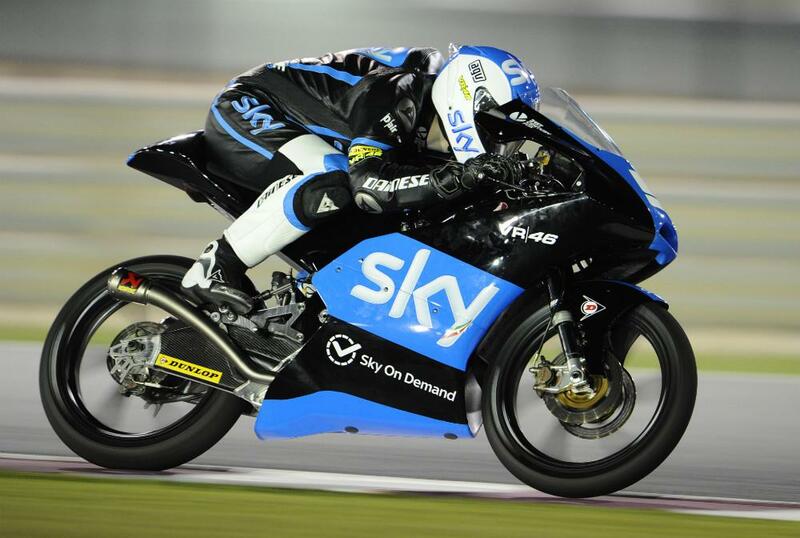 Romano Fenati has topped yet another session on the Sky Italia VR46 KTM machine at Qatar, finishing 0.061 ahead of the Estrella Galicia Honda due of Alex Rins and Alex Marquez. The Hondas, traditionally slower than the KTMs, have been boosted by a new engine spec, and after a dire 2013 are looking like championship consenters, with four of the bikes in the top ten. Jack Miller was fourth on the factory Red Bull Ajo KTM, but fellow Australian Arthur Sissis was forced to sit out the day under medical advice as doctors diagnosed a case of tonsillitis. Jakub Kornfeil was fifth, and Scot John McPhee was sixth, as the Oban lad continues to have an excellent start to his season. Fellow Brit Danny Kent was back in 11th, as his Husqvarna team continues to test parts and setup ahead of tomorrow’s qualifying sessions.